That Sophomore staring up into space isn’t you. This is her first year at a brand new high school and she intends to dumb herself down, show some skin, and wear platform sandals. It seems like a brilliant plan for blending in—and it works. Dances, boyfriends, breaking up with boys you just don’t like—it’s fun for a while, until it’s not. When you find the guy you really like, the one who’s every bit as smart as you secretly are too, you dump him two weeks later because you can’t handle the pressure. Not being yourself is hard. Hiding your true worth behind feathered bangs and professed math ineptitude is stupid. You finally realize that Junior year—and you crush it. Who’s the only girl at school who wins a National Merit Award for the SATs? You are. Who brings home 5s on AP tests? That would be you. Who ties that smart boy for Valedictorian with the highest GPA? 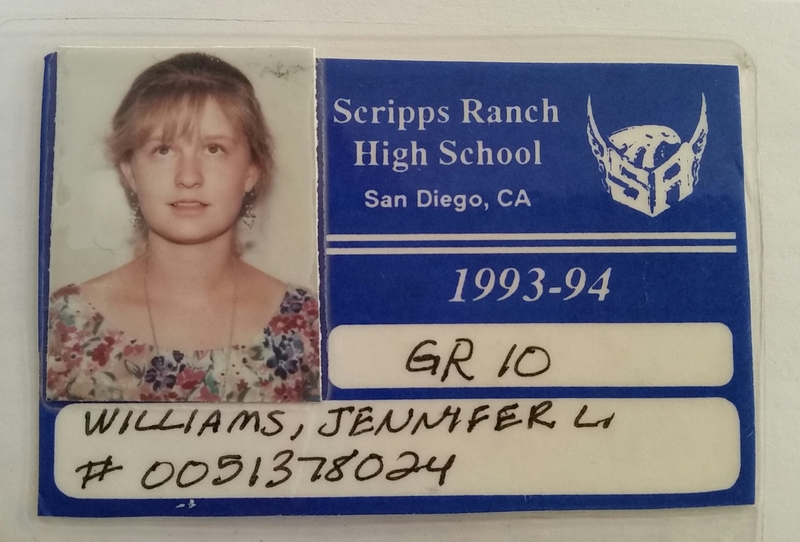 Jennifer, the nerdiest girl at Scripps Ranch High School. You become the classic cliché of smart girl that guys don’t want to date. As the academic accomplishments file in, the boys run away. Dances are things of the past. You still have friends—truly brilliant friends, but nobody wants to kiss you. You’re the girl who doesn’t go to Senior prom. It matters, but it doesn’t. It hurts, but not forever. It’s better to be yourself than pretend to be someone you’re not. A few years later when you graduate from Stanford University you’ll marry the love of your life. He’ll be smart too, plus a collegiate wrestler. You’re the girl who gets the guy with all the muscles! So go ahead, look at that camera and smile. You have a lot to look forward to. Lovely reminder to hang in there!